Pixar’s second television special, Toy Story That Time Forgot, premiered on television yesterday. Like many other projects from the studio, fans who rewatch the 22-minute special will notice the attention to detail given to the dialogue as well as the environments. Chief among the cool surprises is the collection of easter eggs spread throughout. We have found quite a number of them (and we are sure there are more to be found). Take a look at the easter eggs in Toy Story That Time Forgot after the break! Note: Feel free to click on the images to get a closer look at their larger versions. If Disney/Pixar releases official stills of any of the easter eggs, we will make sure to update with the higher-res images. For now, enjoy their semi-clear quality. 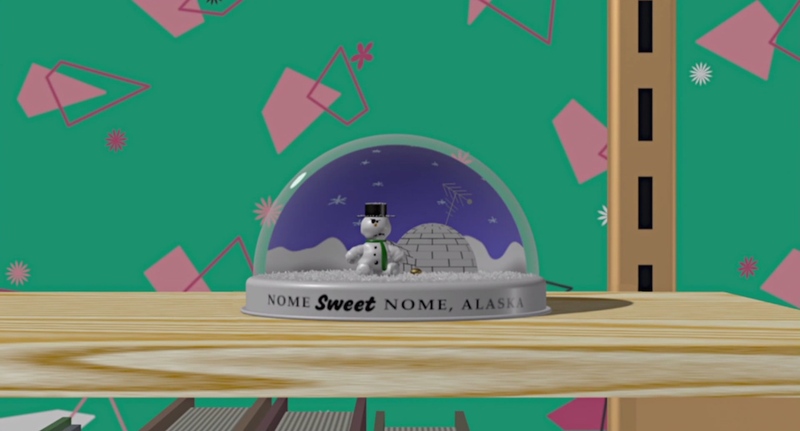 In 1989, six years before Toy Story made it to theaters, Pixar released Knick Knack, a short that was centered around a snowman in a snow globe trying to break out. It provides a fascinating glimpse into the history of the animation studio before it became a household name. Toy Story That Time Forgot (2014). ©Disney/Pixar. In Toy Story That Time Forgot, the snowman inside his snow globe can be spotted in one of the earliest shots. If you look at the bottom left corner of the image above, you can clearly see the snowman fashioning his bowler cap and green tie. Toy packaging can often be one of the coolest aspects to a toy, with companies thinking up great ideas to make their products appear more attractive on the shelves. 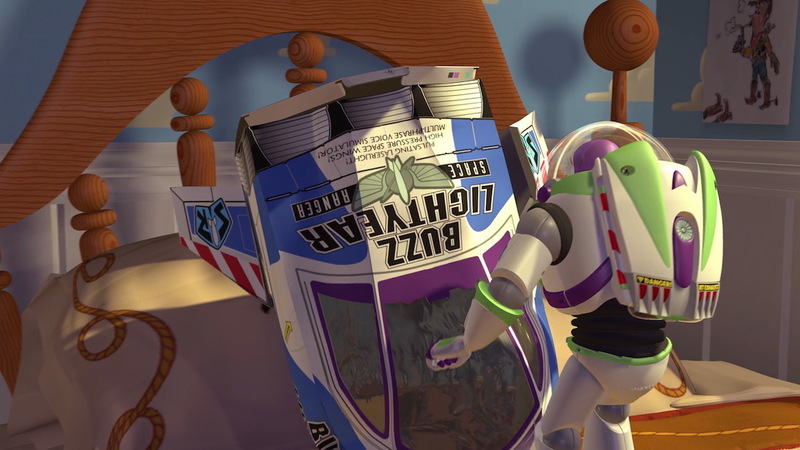 In the first Toy Story, we got a look at the packaging for Buzz Lightyear, made to look like a spaceship. It is an iconic box, one that is recognizable around the world. 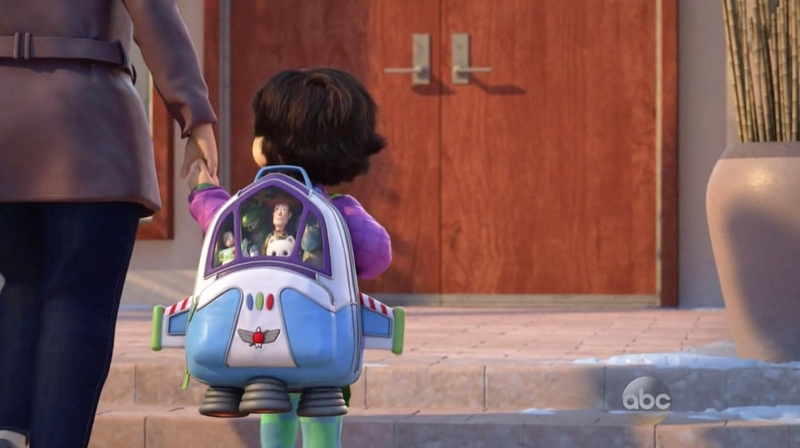 In Toy Story That Time Forgot, Bonnie wears a backpack that is inspired by the design of the spaceship box. This falls more into the line of gag than easter egg, but it is a clever nod nonetheless. Toy Story 3 (2010). ©Disney/Pixar. The opening sequence from Toy Story 3 is one of the best openings seen in any Pixar film. 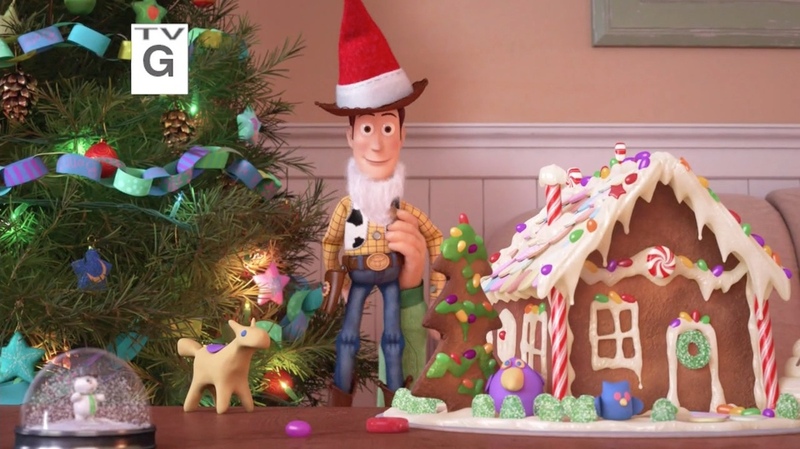 It was a fun recreation of Andy’s playtime with the toys in the first film. 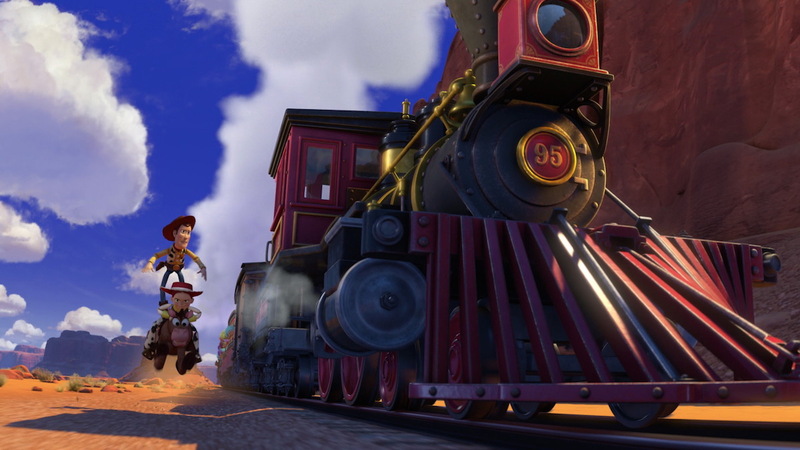 The train in the scene, a red steam locomotive, is a key part of the action sequence where Woody and his friends take on Mr. and Mrs. Potato Head. 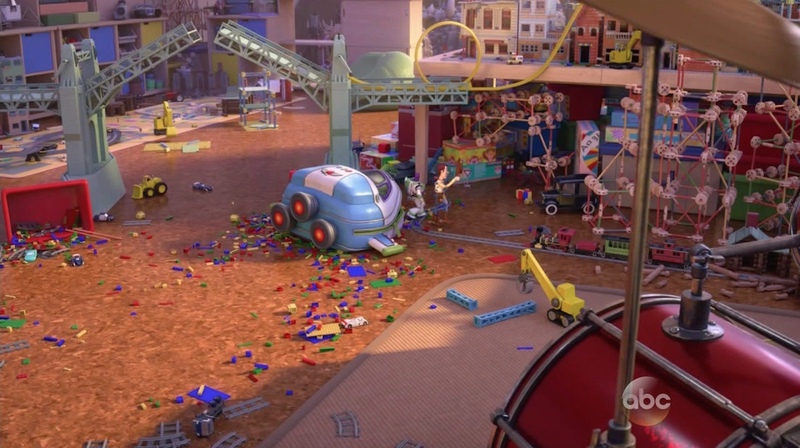 In Toy Story, Buzz and Woody must ride the Pizza Planet Truck in order to reunite with Andy. 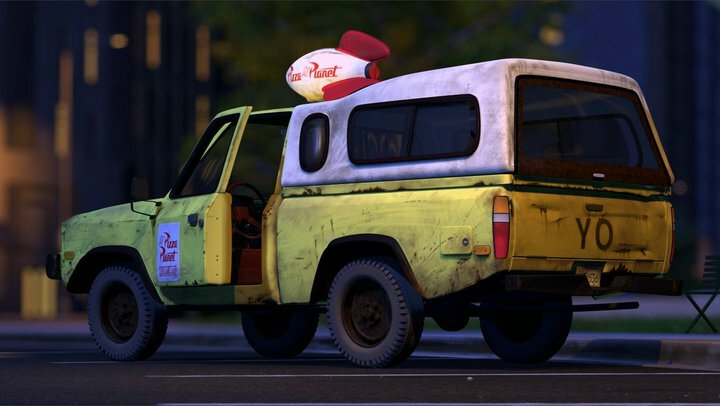 The yellow truck, with its white/red rocket up top, has gone on to become one of the most prominent Pixar easter eggs, appearing in almost every feature film (it was not seen on screen in The Incredibles) and many shorts. 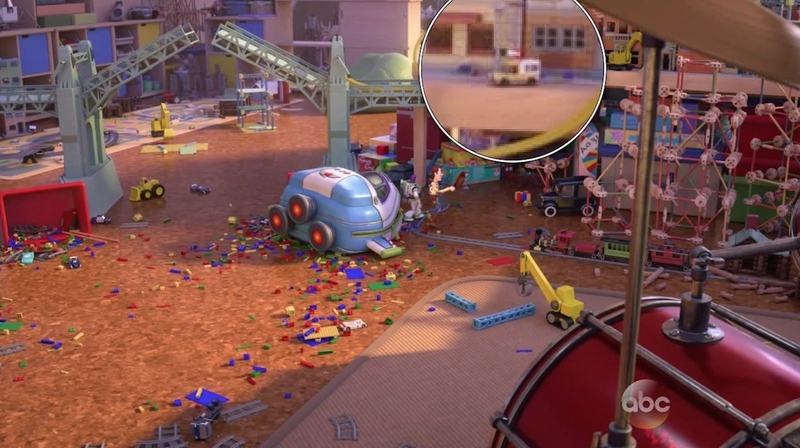 In Toy Story That Time Forgot, a Pizza Planet Truck toy sits by itself on top of a table in Mason’s room. The image above may be rather blurry, but the shape and colors of the toy are definitely in line with the delivery truck.